January 21, 2016 | Meagan Miller & filed under Sponsored Events. International Week features prominent speakers, films, workshops, and performances that address global issues and celebrate cultural diversity. Programming for I-Week 2016 will revolve around the Sustainable Development Goals (SDGs): 17 ambitious goals that aim to “eliminate extreme poverty, fight inequality and injustice, and fix climate change” by 2030. 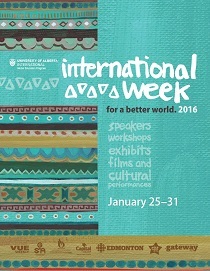 And follow the week’s events with the hashtag #iweekualberta.